Home / Unlabelled / 'We Want A Jewish State': Nnamdi Kanu Speaks On Igbos And Jewish Heritage . 'We Want A Jewish State': Nnamdi Kanu Speaks On Igbos And Jewish Heritage . 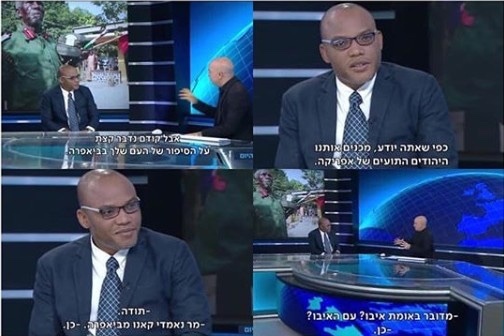 The leader of the Indigenous People of Biafra (IPOB), Nnamdi Kanu, was featured yesterday on Israel National TV, where he spoke about his arrest, incarceration and issues with the federal government. The IPOB leader who was introduced as Nnamdi Kanu of Biafra, was asked how do Biafrans perceive themselves as Jewish people considering their roots. Nnamdi Kanu replied by saying that Biafrans (Igbos) are about 70 million people scattered all over the world and those that identify themselves with their Jewish heritage are nearly 50 million. The IPOB leader said that a significant number of Biafrans practice Judaism in terms of their prayers and in other areas. Nnamdi Kanu also said that when Christianity came, the Jewish heritage was suppressed and they were made to feel ashamed of their "roots". He said luckily, some of the Biafrans maintained the Jewish culture till today as he sited Umuleri village in Anambra state as an example where the Jewish tradition is practised.. The IPOB leader also said all Igbos are Jewish but the problem is the influx of Christianity in Nigeria through colonialism which dampened down the Jewish tradition and shifted the focus from the Old testament to the New Testament. He said the Igbos are the Jews of Africa. Nnamdi Kanu said that Biafrans want to get back to the way they were before the British came because the way Nigeria was put together is the root cause of the problem. He also said that IPOB wants an independent Jewish state of Biafra that would be independent of anything to do with Nigeria. He said they want a Jewish state in order to go back to that way of life to worshipping the one and only true God in a Jewish way. The IPOB leader said that Biafrans won't be flocking to Israel if they are emancipated but would return to Biafra land and remain there. He also spoke about his arrest and also being locked away for 19 months for demanding for independence. Watch the video of the explosive interview below.